Crew: David Lueken, Dan Lueken, Clint Palmer. Sponsors & Support: Bremer Farm & Cattle, Kayton International, B&G Body Shop, Frey Custom Silage, Country Laminates, 14-91 Juction, Krohn Brothers, Radio Shack - Albion, Noble Land & Cattle, AgVenture Seed, B&S Construction - Lincoln, Doc's Service, Ras Motorsports, Whiskey Creek - Norfolk, True Value - Albion. Thanks to Dave Nall for his help. 1997 - Boone County Raceway Bomber Points Championship. 1998 - Boone County Raceway Bomber Points Championship, Boone County Challenge A Feature win. 1999 - 9th in Boone County Raceway Street Stock Points. 2000 - 6th in Boone County Raceway Street Stock Points. 2001 - Boone County Raceway Street Stock Championship, 3 A Feature wins. 2002 - 5th in Boone County Raceway Street Stock Points. 2003 - 5th in Boone County Raceway Limited Late Model Points. 2004 - 8th in Boone County Raceway Limited Late Model Points. 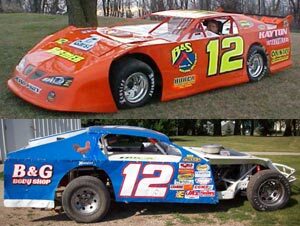 2005 - 2nd in Boone County Raceway Limited Late Model Points, Nebraska Limited Late Model State Championship at Junction Motor Speedway, Eagle Raceway Fall Jamboree Championship, CNCTA Feature win at Junction Motor Speedway. 2006 - 2nd in Boone County Raceway Limited Late Model Points, repeat Nebraska Limited Late Model State Championship at Junction Motor Speedway. 2007 - Boone County Raceway Limited Late Model Championship, three-peat Nebraska Limited Late Model State Championship at Junction Motor Speedway. 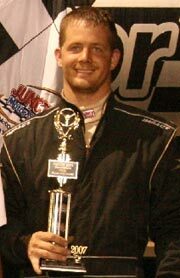 2008 - Boone County Raceway Limited Late Model Championship. 2008 - 7th in Boone County Raceway Modified Points. Ever since I can remember we raced everything that we could race from wagons and bikes to sleds. Then we moved to Go-Karts. I raced against my brothers and cousins with 5hp Briggs around the old corn crib at Grandma and Grandpa's farm, then later made a high-banked track out of the dried up pond. Our uncles always raced. I remember going to the races and rooting for them. In 1999 I was in the Top 4 in Points and just figuring out a new car that we built from the ground up. While running second in the A Feature, the right rear axle broke and I rolled. The car was bent really bad and took four weeks to fix. In 2000, I raced the same car but it just was never the same and we broke three trannies that year. In 2001 we built a new car. In 2003 I am running a Limited Late Model.